Good morning, friends. So, I did write on Friday, I swear, but apparently I didn’t post what I wrote. It would be silly to post it now, as it was very time oriented, so we’ll just skip it and move on. This weekend we played host to a friend of my husband’s and his girlfriend, whom we were meeting for the first time. It was a very interesting weekend full of driving and walking through soggy trails and eating food and bad movies. That’s how weekends with Logan’s college gang go. I went on a cleaning frenzy, scrubbing the bathroom, vacuuming everything, dusting for once. I’m pretty ashamed of my dusting habits. I know I should dust more, but I just never think about it, since I can’t really see it until I really look at a thing and then I’m like, “Oh yeah, that should be a thing I do.” Anyway, my whole day was basically spent cleaning with a break for lunch and then Logan came home and did the kitchen, because that’s his cleaning assignment. We ate dinner from Giant Eagle, as we’ve been doing a lot recently. It counts as groceries if its from the grocery store, but we also don’t actually have to make it. So once that all was done we settled in to wait for our guest to arrive. Logan’s friend Dave and his girlfriend Becca got in around 11 or so and we all went to bed shortly after that in preparation for an early day Saturday. We got up at 6:30 and Calamity was so excited and confused. The cats were a little skittish in general with new people in the house, but the fear of new people could not keep them away from the food dish when the alarm went off. The alarm is the signal that someone is definitely going to get up and feed them and Calamity, who is the one to pace across us and head boop us into feeding her, gets so excited whenever it goes off. Unfortunately, it was half an hour before their actual feeding time. We ended up splitting the difference and feeding them at 6:45 since they were so eager for food and confused as to why we were up and yet not feeding them. Logan’s friend Scott had found a place to hike that was about an hour and a half away from us. It’s called Mount Davis and it’s the highest point in Pennsylvania. No one had ever been out there before, he just thought it looked cool so he picked it for our meeting place. So we drove all the way out there, along all the crazy windy, hilly, back roads, behind two horse drawn buggies, to find, basically nothing. We were told there was a gas station and a store in this town and we found the store, such as it was. It called itself a grocery store, but it was really more like a sadly stocked convenience store at best. I had hoped that we would find a rest stop or something to get breakfast at during our trip out but there was nothing. We got to the grocery store and looked for something to eat in there. I found some granola bars and that was the best we could do. Logan got a can of mixed nuts and that was our breakfast. So we all meet at this sad little grocery store over the course of an hour and caravan over to Mount Davis proper. It had been raining the whole time we were waiting for people to show up, but once we got out there it cleared up, thankfully. The trails were all wet and very rocky, but we manged a good three mile hike without too much inconvenience. We went up to the observation tower that was there and it was terrifying. The stairs were steep and narrow and the safety rails were not as high as one might hope. 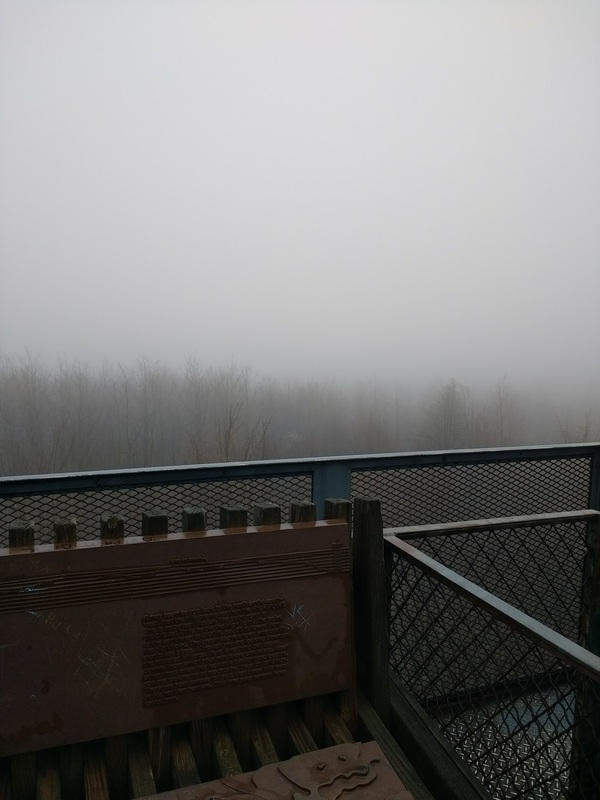 The view was foggy, so it was a little disappointing, but we all walked up there anyway and all the way back down, trying not to hang onto the wet, cold metal hand rail. We said goodbye to Dave and Becca early in the morning and sent them on their way up to Beaver Falls for church. From there everything went back to normal. The cats came out of hiding and reclaimed the back room where Becca had been sleeping. She’s slightly allergic to them, so they weren’t allowed back there while she was staying with us. We got ready for church ourselves and even got to drink some coffee as we were actually up at a reasonable time. After fellowship meal we hung out with the family, as usual. We ate many tacos and enjoyed time together. All in all, it was a very nice weekend. It’s always great to see the college gang again, since they’re so scattered over the east coast. It was nice to finally get to meet Becca and get to know her. She’s quite a lovely human, we like her. Despite the rain and the wet, we had a really good time. I hope your weekend was as fun and full of adventures as mine. Have a lovely day, my friend.